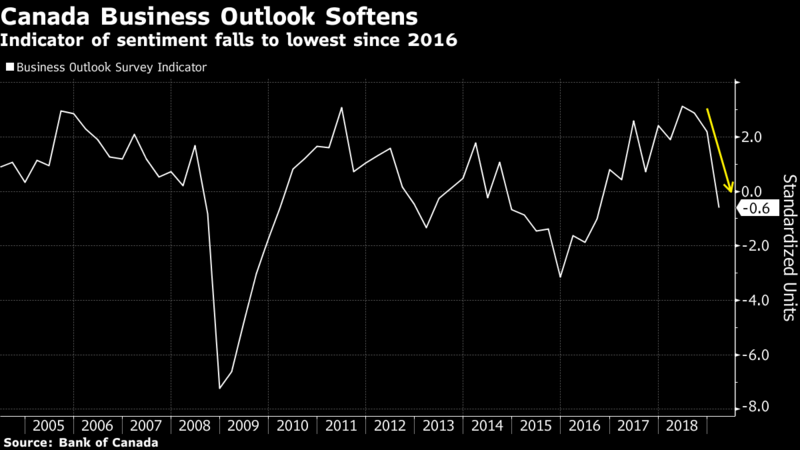 The Ottawa-based central bank’s first-quarter survey of executives -- which took place in February and March -- showed soft expectations for sales along with a sharp decline in the number of companies reporting labor shortages. The Bank of Canada’s composite gauge of sentiment turned negative and dropped to its lowest since 2016. The weakening picture reflects how the confluence of headwinds -- from global trade wars, to last year’s slump in oil prices and a sluggish housing market -- is beginning to ripple through the nation’s economy. Few signs of any capacity pressures in the report will only reinforce expectations the central bank will keep interest rates on hold indefinitely. The Canadian dollar reversed gains after the report, declining as much as 0.4 per cent to trade at $1.3371 against the U.S. dollar at 10:36 a.m. in Toronto. The yield on 2-year government bonds fell 3 basis points to 1.61 per cent. The share of companies reporting at least some difficulty in meeting increased demand fell to 31 per cent, the lowest since 2015. Readings on labor shortages also weakened to multi-year lows, while inflation expectations showed a marked softening. 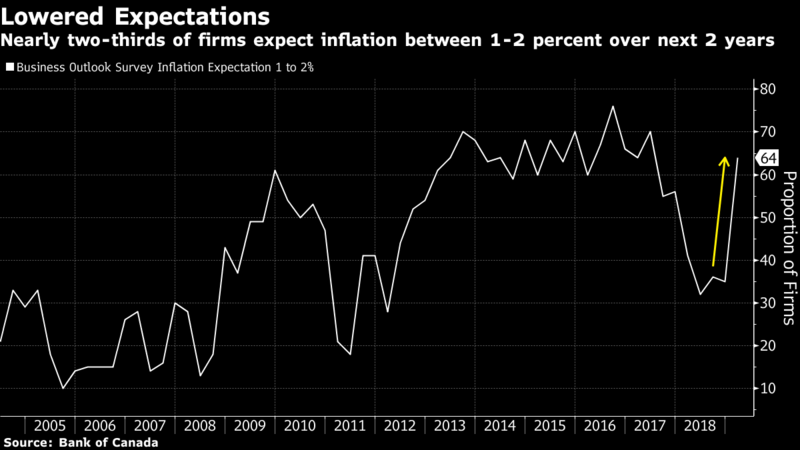 About two-thirds of all executives surveyed expect inflation won’t surpass 2 per cent over the next two years.